The story takes place in ancient times, around the Jurassic period. A spaceship comes to the Earth with a purposebut what purpose? And who is in the spaceship, and what are they bringing? Watch this page for new details! Chapter 5 Who came out from the Tower? "Thank you very much." Golem bowed politely to the chiefs and returned to the Tower. Several days later, about 100 humans came out from the Tower. To the fairies' surprise, none of them could speak any language properly. Besides, they did not wear anything. "They are just like babies," the fairy villagers thought. The villagers assiduously took care of the humans. They gave them clothes and food. They taught them how to speak. Gradually, the humans began behaving as humans and developed the capability to live on their own. However, though the humans seemed to live happily in the village, they did not settle down in Toh-no Land. Little by little they began to leave the village for new frontiers. Eventually all of them had gone. The kind villagers who had looked after them were very disappointed, as they had certainly enjoyed doing caring for them. 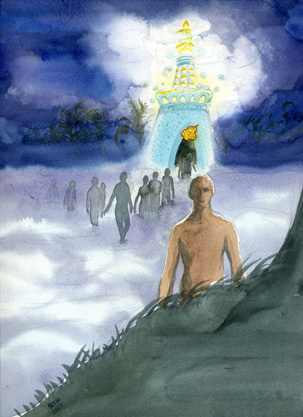 The chiefs thought maybe they should not have given Golem their permission to activate the human seeds. From that time, the villagers occasionally visited human villages and towns to see if they were doing all right. They helped the people when they were in trouble, and sometimes played tricks on them. But the fairy villagers couldn't believe, as they watched the people, that the humans were wise enough to create the Tower or Golem. "Maybe you made mistake when you picked up the seeds," they said to Golem. He replied, "they do not have such a capability when they are born. They need to accumulate a long, long history in order to develop a sufficiently advanced civilization." Several days later, about 100 humans came out from the Tower.